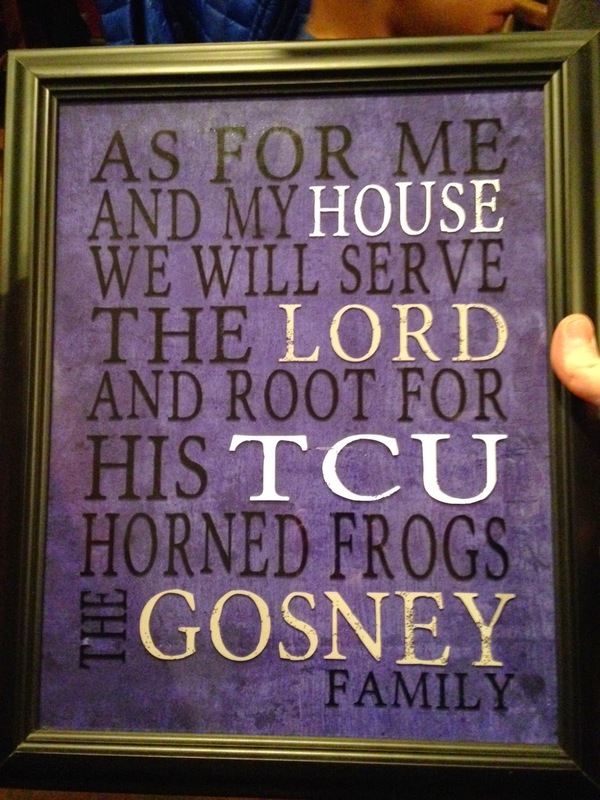 Comrades True: Serve the Lord, cheer for the Frogs! Hail, all, hail. TCU! Mem'ries sweet, comrades true. Serve the Lord, cheer for the Frogs! Ryan Gosney '95 received this framed message as a gift from the receptionist at his office. "I think she made it! The Gosney family is ready for the Frogs to rock the Peach Bowl!!" he wrote. "Hope you get to be at the game!!" Ryan is the chief financial officer for Denver-based Dorado & Partners, LLC. Read more TCU People stories at The TCU Magazine. Are you a fan of The TCU Magazine on Facebook? Please "like" us to stay current on TCU photo galleries, story links, trivia, nostalgia and more.